Iwo-Tori-shima, which is being considered as a site for the relocation of the Tori Shima range of the U.S. military. The photo was taken in 2002. 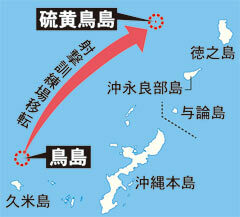 Defense Minister Toshimi Kitazawa explained this at the Okinawa Policy Council meeting held on May 23. Because of the considerable travel distance involved for the U.S. military, the MOD is also considering using the Iejima Auxiliary Airfield as a fuel supply point. It is reported that on May 25 Mayor Taira telephoned Rou Manabe, the head of Okinawa Defense Bureau, to state his opposition to this proposal. The U.S. military have mistakenly fired depleted uranium bullets at the Tori Shima range in the past. The harmful effects on the surrounding environment and the risk of the land being submerged due to the change in its shape because of military training have been a cause for concern for some time. Although Okinawa Prefecture and Kumejima Town have both requested the early return of Tori Shima range, there is no indication that this is going to happen. The MOD is considering changing the location for the training currently carried out at the Tori Shima range in order to secure the return of the island. A top MOD official said, “We are not trying to move the location for the training to somewhere else within the prefecture, nor out of the country, but to the most appropriate spot.” The MOD is considering relocating the Tori Shima range, located about 28 kilometers north of Kumejima, to Iwo-Tori-shima, a deserted island located about 190 kilometers north-northeast of Naha. The Council for the Promotion of Dezoning and Reutilization of Military Land in Okinawa requested the return of the Tori Shima range at a meeting held on May 23 to discuss how to alleviate the burden of hosting U.S. military bases. A deserted island in the northernmost region of Okinawa, located 190 kilometers north-northeast of Naha and 65 kilometers west of Tokunoshima, Kagoshima Prefecture. The island has seven kilometers of coastline and comes under the jurisdiction of Kumejima Town. 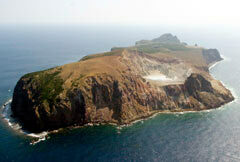 Comprising two conjoined volcanoes, Iwo-Tori-shima is the only active volcano island in Okinawa. It has been the source of sulfur since the time of the Ryukyu dynasty, when its sulfur was taken as a tribute to China. Its northwest volcano erupted in 1956. One month of falling ash and ash deposits caused the island’s entire population to leave. The latest eruption was confirmed as occurring in July 1968.